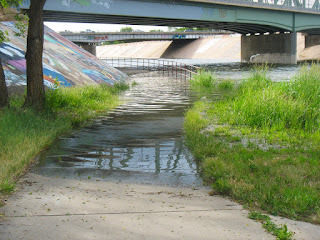 Just a cautionary note, the Arkansas River trail near the Moffat Street Bridge is about 3 feet under water, due to river flows that are at about 5500 cfs and will probably be up for a few days as the final push of snowmelt is coming off in the Upper Arkansas basin You can make it through the water on the trail, but you get wet feet...which actually feels great when it's 105 degrees out. Be careful and have fun! *Note, the trail under the 4th street bridge is still closed during working hours.